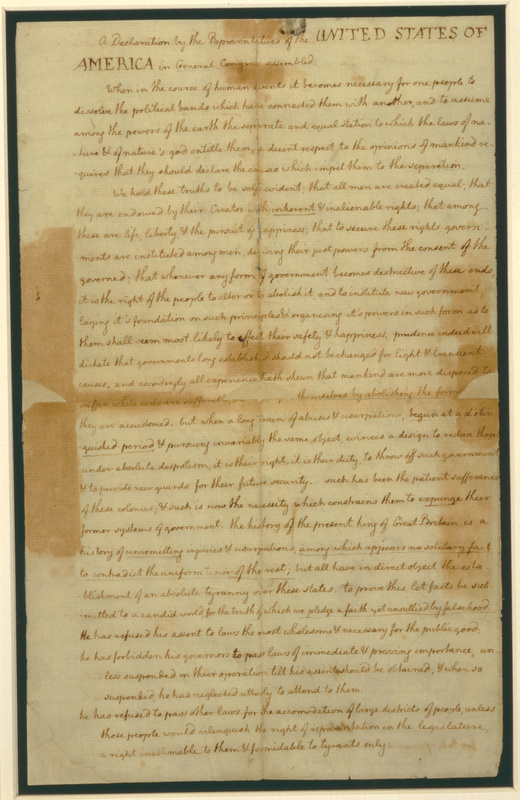 From the early colony of Pennsylvania, to the American Revolution, the Declaration of Independence and the Bill of Rights, the Magna Carta was influential as a symbol of liberty in early America. 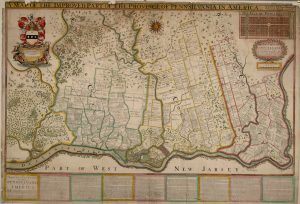 The 13 colonies that fought the War of Independence to become the United States of America were first founded by a number of different British settlers, each under the auspices of a colonial company, granted land and legal rights by the Crown. Along with settlers, these companies brought with them a charter. 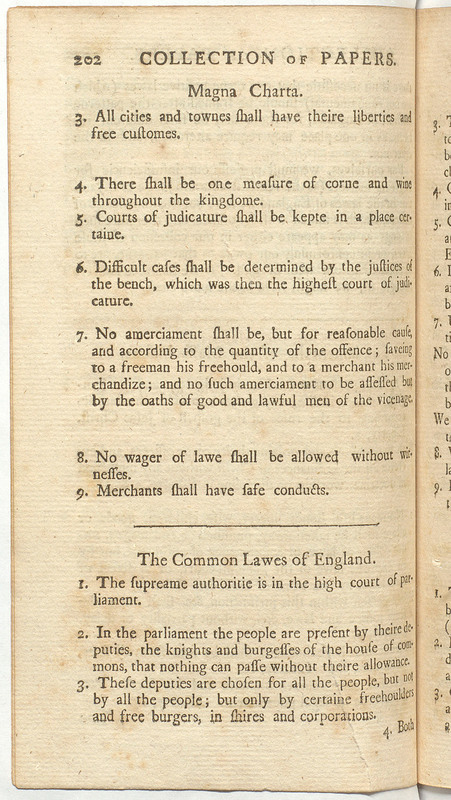 Many of these included clauses highly indebted to the early modern interpretation of Magna Carta, particularly concerning the right to due process of law. 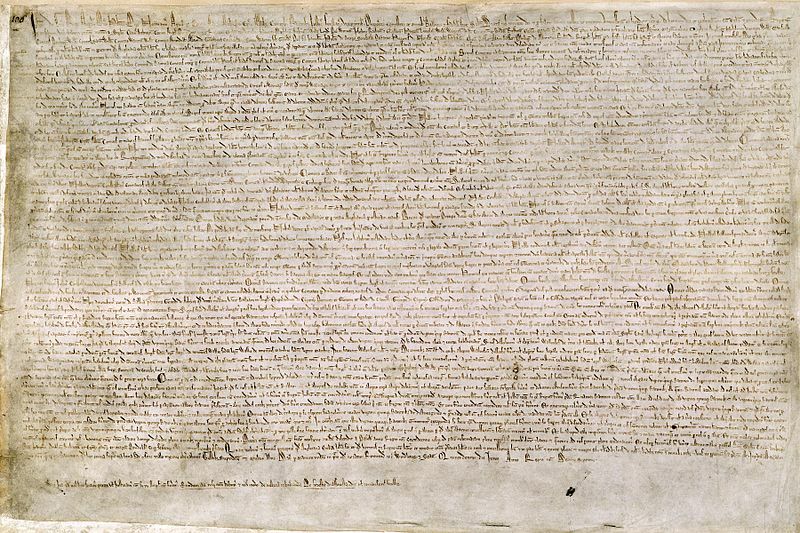 Charters also included a statement that the settlers, and their descendants, were entitled to the ancient rights of English people, such as the fundamental rights enshrined in Magna Carta. 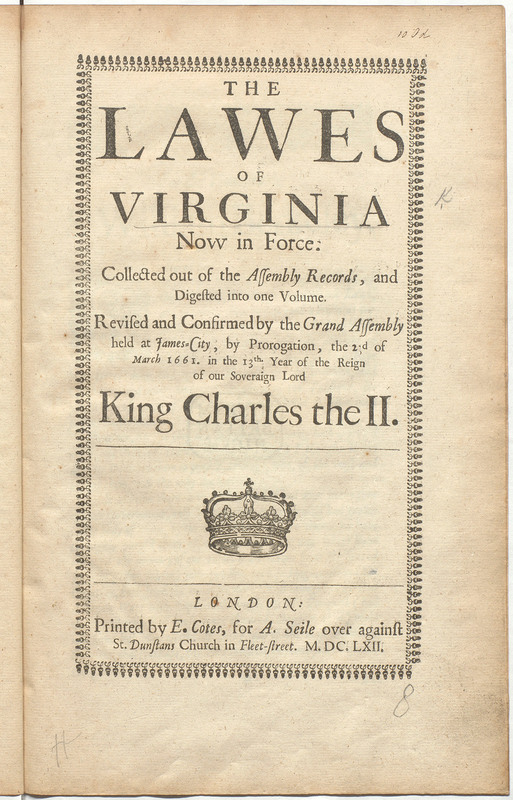 As the Virginia Charter made clear, emigrants and their children ‘shall have and enjoy Liberties, Franchises, Immunities, within any of our other Dominions […] as if they had been abiding and born, within this our Realm of England.’ Such language, which defended colonists’ rights as free English subjects, was replicated by subsequent colonial charters: for example, that of the Massachusetts Bay Colony of 1629, declared that settlers should ‘have and enjoy all liberties and Immunities of free and naturall subjects […] as yf they and everie one them were borne within the Realm of England.’ In such a fashion, a tradition of English liberties was inculcated early in North American colonies, as well as an inclination towards written constitutions. 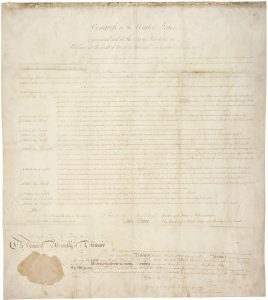 Both the specific legal protections afforded by Magna Carta and the more general claim of ancient rights would prove to be crucial in the rhetorical stand-off between the Americans and the British Crown during the 18th century. 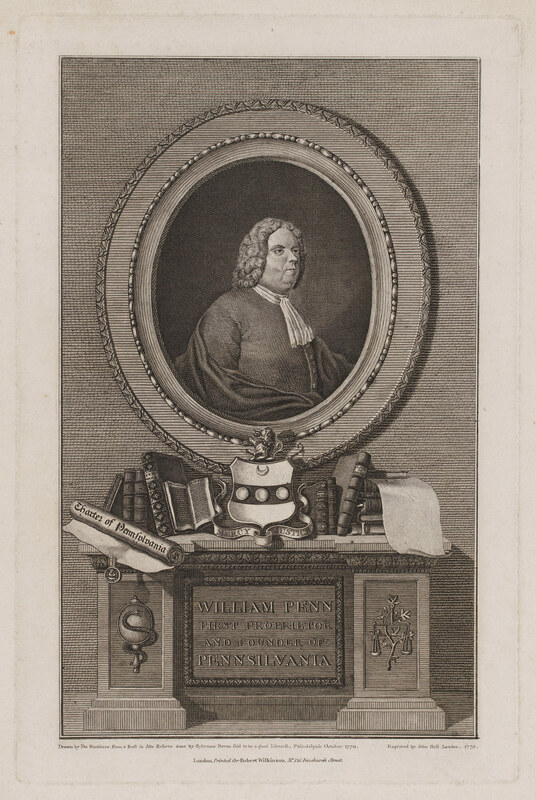 In 1682, William Penn (1644 -1718), a wealthy Quaker, arrived in his new colony of Pennsylvania, which he had been granted by King Charles II (r.1660–85) in lieu of the King’s debt to him of £16,000. 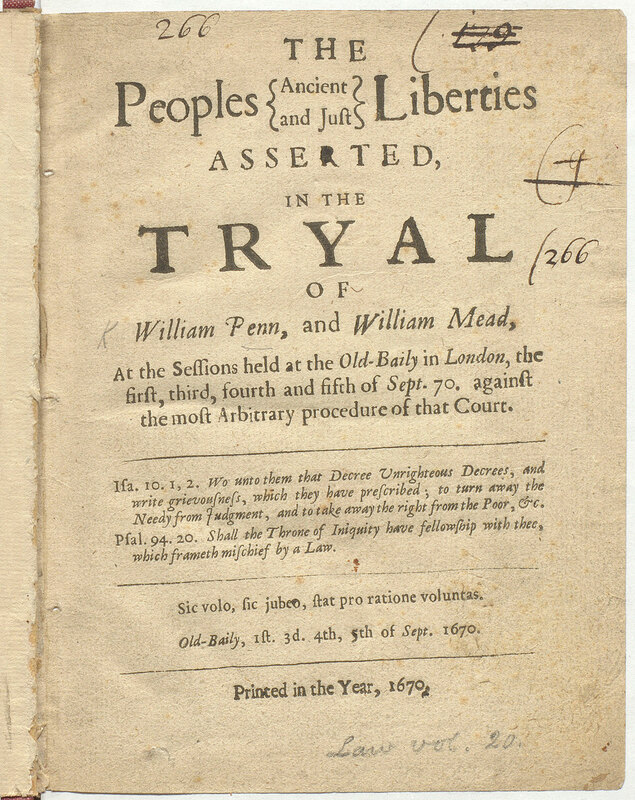 Penn had suffered at the hands of the English legal system for his religious beliefs, and became highly-versed in how Magna Carta’s clauses defended the right to a fair trial. He brought with him to America a constitution for the colony, and had an English translation of Magna Carta printed in the new city of Philadelphia. 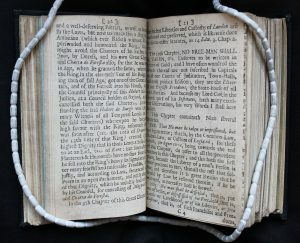 His constitution drew on the language of the Charter, particularly clause 40, which stated that ‘to no one will we sell, to no one deny or delay right or justice’. 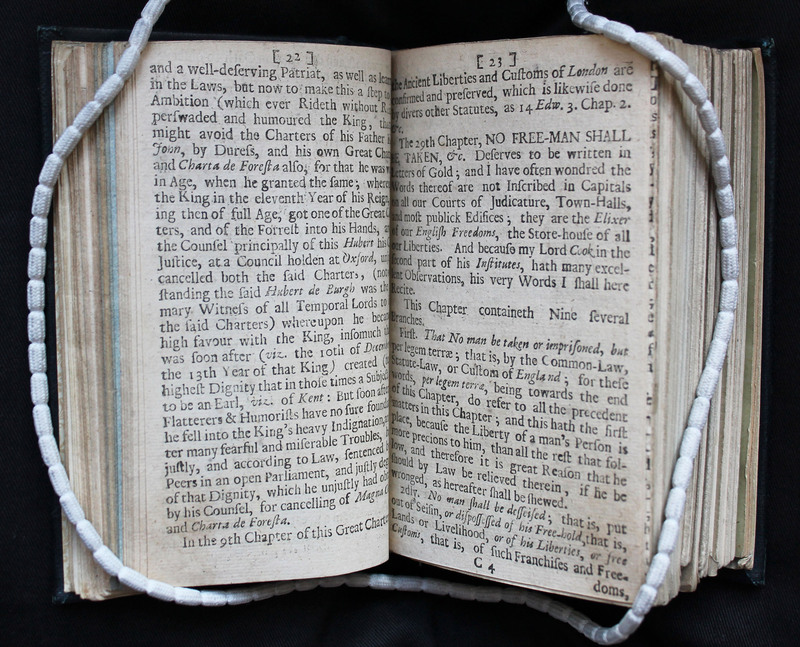 Penn was not the only settler to import Magna Carta in print. For their legal training law students relied on legal primers and editions of the works of lawyers such as Sir Edward Coke (1552 – 1634) and William Blackstone (1723-80) who had written extensively on the Charter. One, a young Thomas Jefferson (1743-1826), wrote to a friend of his exasperation in reading pages of Coke, ‘I do wish the Devil had old Coke, for I am sure I never was so tired of an old dull scoundrel in my life’. 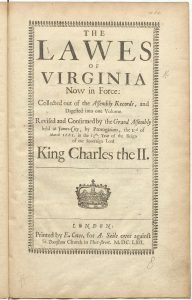 Nonetheless, his ideas, as taught by the Virginian judge and law professor George Wythe (1726-1806), had a profound influence on the thinking of the future author of the Declaration of Independence. Although inhabiting the New World, Americans were accustomed to seeing the historical ties between them and Britain. 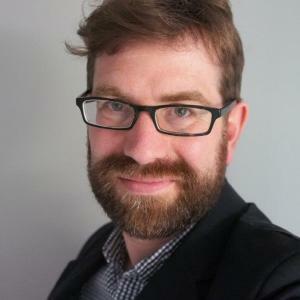 When their rights were threatened, it was natural to appeal to the notion of ancient, fundamental rights, and the charters and laws that upheld them. 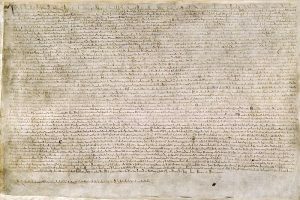 Magna Carta offered the greatest symbol of such rights; furthermore, it was created in response to historical abuses of rights. 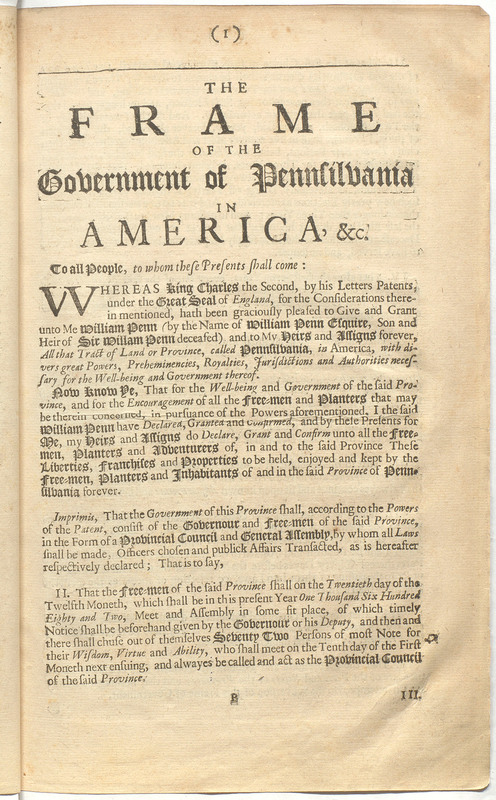 As tensions rose between Britain and America over questions of taxation, governance and military quartering — made all the more intense by the expense and difficulty of governing overseas colonies after the French and Indian Wars (as the Seven Years’ War played out in the Americas) — a great political and philosophical debate broke out in pamphlets and newspapers, as well as in coffee houses, taverns and town halls, about the rights and responsibilities of a colony and the metropolis. 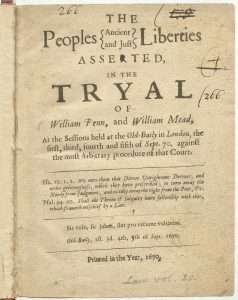 Arbitrary exercises of power by the British military commanders and governors went against the Great Writ of liberty (habeas corpus), and challenged what the colonists argued was their fundamental claim to ancient rights. 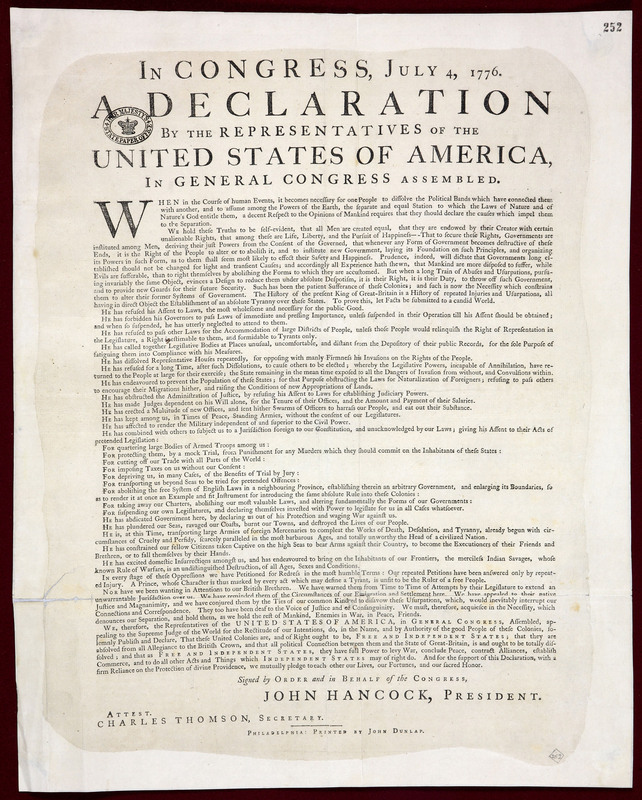 The American Revolution arose from a number of causes, and not all colonists were convinced of the need to rebel. 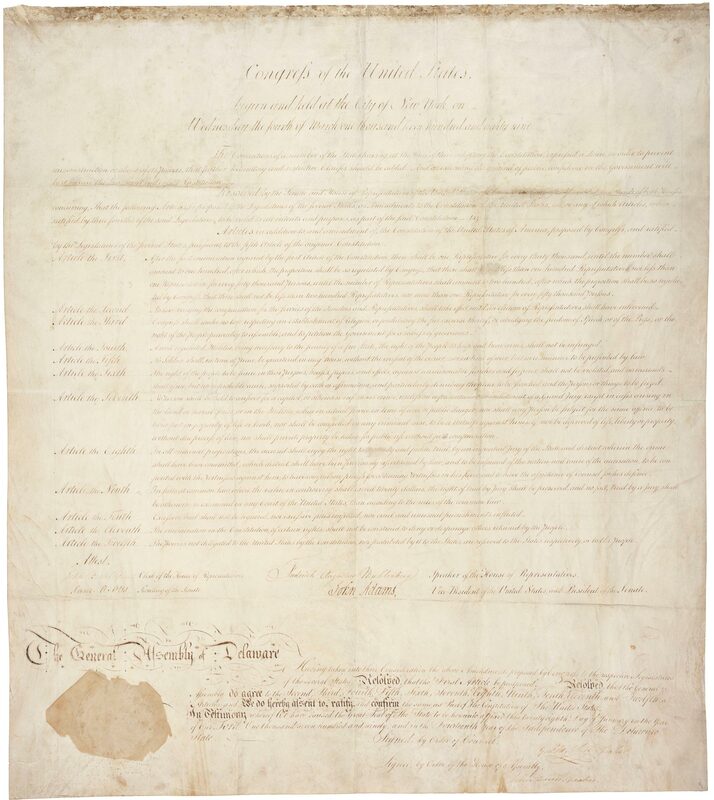 But foremost among these were the British violation of the rights of the colonists in a series of Acts introduced from 1763, which taxed or imposed other obligations upon them without consent or consultation. 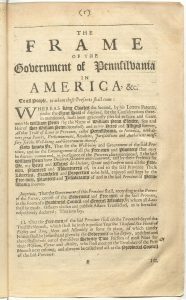 The issues were made starkly clear when, in London in 1766, Benjamin Franklin (1706-90) was hauled in front of Parliament and asked on what basis he called for the repeal of the Stamp Act. The colonists, he answered, could not ‘be taxed but by their common consent’. It was a freedom based on their rights ‘as Englishmen,’ Franklin continued, ‘as declared by Magna Carta’. Thomas Hutchinson (1711-80) summarised the view in Massachusetts: ‘the prevailing reason at this time is, that the Act of Parliament is against Magna Charta, and the natural rights of Englishmen, and therefore, according to Lord Coke, null and void.’ The Colonists objected to these violations to their rights to property, liberty and due process of law, which they argued belonged to them as Englishmen. 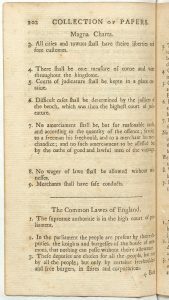 In 1774 they issued a Declaration of Rights and Grievances, which reasserted their ‘undoubted rights of Englishmen’, including the right to trial by jury — something that had been curtailed in cases heard before the new admiralty courts. 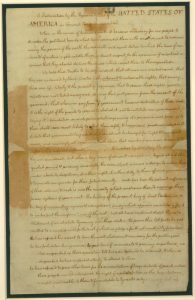 As the colonists began to organise themselves through a Continental Congress, Magna Carta provided a simple symbol for their cause. Massachusetts chose a militiaman with a sword in one hand and a Magna Carta in the other for its new seal. The same motif reappeared in 1775, in a design for a new 30-shilling banknote by the revolutionary engraver Paul Revere (1735-1818). 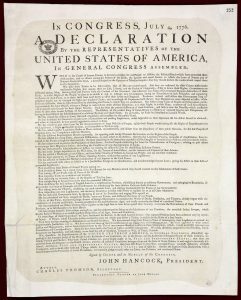 Finally, in July 1776, after open warfare had begun, the Congress agreed on the Declaration of Independence which drew explicitly upon Magna Carta in its itemisation of rights and grievances against the British Crown. This entry was posted in Britain, England, History, Medieval, Middle Ages, United States. Bookmark the permalink.